Sure, that roll of flab makes you look out of shape, but your muffin top could also be a serious health threat. The solution is to practice girth control — and our experts will show you how. The nicknames for the extra padding around your middle may be cute, but the reality of belly fat is anything but. Although fat can be found in almost any part of your body, the kind that attaches itself to your midsection tends to be the hardest to shed and the most resistant to spot exercises such as crunches -- no matter how careful you are not to overindulge during the holiday season or how firmly you stick to your New Year's resolution to actually do those crunches every day. And, unfortunately, as women age, the belly increasingly becomes fat's destination of choice. "When a woman reaches her 40s, excess fat is likely to accumulate around the abdomen," says Steven R. Smith, MD, an obesity expert at Florida Hospital and Sanford-Burnham Medical Research Center in Orlando. "This belly fat is often just a redistribution of fat to the abdomen rather than a gain in total fat." So even a thin woman may be chagrined to discover that, as her estrogen levels decline during perimenopause, she is suddenly sporting a "meno-pot." "By losing estrogen, you lose some of the normal contour of your body," explains Michael Roizen, MD, chief wellness officer at the Cleveland Clinic and the founder of RealAge.com. "Instead of weight settling on your hips, it goes to your belly." Essentially, belly fat takes two major forms: subcutaneous fat (the visible kind just below the skin -- that roll of blubber you can grab hold of) and visceral fat (which is embedded deep within your abdomen and wraps around the organs clustered there). Though the first kind of fat may be more damaging to your looks, the latter kind poses the far greater health risk. And, weirdly, this fat is not always evident. 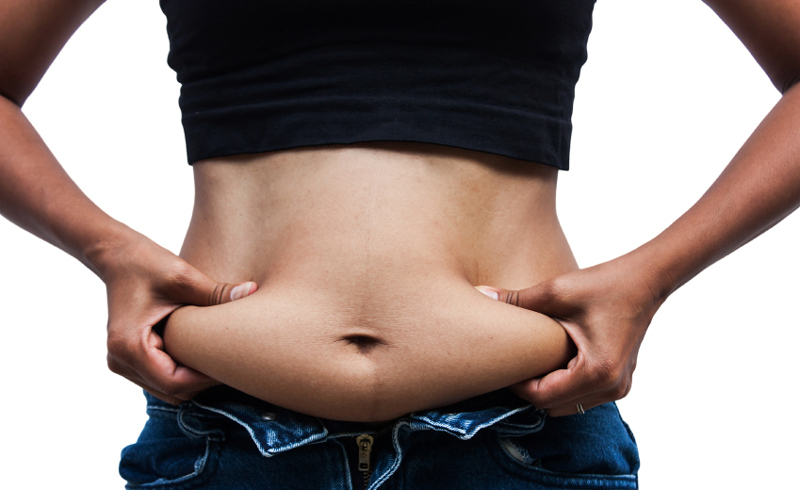 Even if you're not overweight, you still could be packing a lot of visceral fat. Hidden or not, visceral fat does a real number on your health because of where it sits in the body. With fat, as with real estate, it's all about location, and each fat "depot" has a highly specialized function. "We used to think all fat was created equal, that it was just a storage bin for excess calories," says Elizabeth Ricanati, MD, a consultant to the Wellness Institute at the Cleveland Clinic. "But that's not true." Fat, like muscle, is now known to be metabolically active; it produces dozens of chemicals, including hormones that signal to the brain that someone is hungry or satisfied. "Indeed, we now think of fat tissue depots as endocrine organs," says diabetes researcher Philipp Scherer, PhD, a professor at the University of Texas Southwestern Medical Center at Dallas. In other words, fat releases hormones that vary depending on where the fat is located. You may despise the fat that clings to your thighs, but research suggests that the hormones produced there provide a health benefit. "We don't know all the details," says Dr. Smith, "but it is clear that the fat in the hips, and particularly in the thighs, protects against some of the health consequences of obesity, such as diabetes, by producing substances that increase insulin sensitivity." Visceral fat, on the other hand, is known to produce inflammatory agents that can, over time, increase the risk of cardiovascular disease, hypertension, type 2 diabetes, and breast and colorectal cancers. So are belly fat and its attendant health problems inescapable side effects of aging? The answer is a qualified no. "It's never too late to have a tight stomach," says Jackie Keller, author of Body After Baby. "But there's no easy fix." The best way to shrink fat cells overall is to lose weight. But make no mistake: Visceral fat is not easy to shed. Start by figuring out your current daily calorie intake. Then cut that number by one quarter. Researchers from Columbia University found that simply reducing daily calories (without adding exercise) can shrink fat cells by up to 18 percent, particularly those in subcutaneous fat. Health bonus? Fat shrinkage also improves the body's ability to use insulin, thereby guarding against diabetes. Balance the power. An ideal fat-burning meal plan includes 30 percent protein, 40 percent carbohydrates, and 30 percent fat. In a 2009 study, dieters who stuck to these ratios lost 22 percent more belly fat after four months, and 38 percent more after a year, than those who followed a low-fat diet. Turn up the volume. Foods containing a lot of water and fiber (salads, vegetables, fresh or dried fruits, and whole-grain breads or pasta) expand in your stomach and make you feel full faster with fewer calories. Stack the snacks. Eat small portions of healthy snacks three times a day. In research from Georgia State University, athletes who followed this pattern burned more fat and calories than those who waited for long periods to eat. Go green. In a 2009 study, women who drank about five cups of a beverage containing green tea each day, combined with exercise, lost more belly fat than those who merely exercised. In addition to losing one inch around the waist, the tea drinkers decreased subcutaneous fat by 6 percent and visceral fat by 9 percent within 12 weeks. Researchers attributed the loss to catechin, an antioxidant in green tea. Fight fat with fat. It sounds counterintuitive, especially after the 1990s fat-free craze, but a growing body of research suggests that a diet rich in monounsaturated fatty acids (popularly dubbed MUFAs) keeps belly fat at bay. Among the most common foods containing MUFAs are olives, nuts, avocados, and the oils from these foods. Get off the couch. Going for a brisk 45-minute walk five times a week not only helps you lose flab but also has been shown to reduce the disease-causing inflammation in visceral fat. You should aim for a pace of three to four miles per hour. Don't have that much time available all at once? According to trainers and other fitness experts, bouts of exercise as short as one minute each can still benefit your belly -- as long as you log a minimum of 30 minutes of physical activity a day. Raise your rate. Increasing your heart rate to 80 percent of its maximum for 40 minutes can speed up your metabolism for 19 hours. Subjects in a 2009 study who did this three or four times a week (through moderate exercise like biking, dancing, or climbing a StairMaster) were able to maintain previous weight loss without gaining visceral fat. (Those who ate a balanced diet but didn't exercise added visceral fat.) To calculate this target heart rate, subtract your age from 220, then multiply by .80. Up the ante. Want even quicker results? Try an interval workout that alternates high- and low-intensity exercise. The powerful bursts of energy use more fat as fuel and the rest periods in between allow your body to flush out waste products from muscles. Bonus: High-intensity interval training may suppress the hunger hormone ghrelin. Join the resistance. Why? Resistance training builds muscle, and more muscle means a faster metabolism. Aim to strength-train for at least 30 minutes two to three times a week and switch up lower- and upper-body exercises. Tip: Experts say that you burn more fat by lifting weights before your cardio workout. Cut to the core. To attack your fat even more effectively, target the deeper layers of muscle along your abdominal walls by doing Pilates, yoga, and mat exercises such as crunches and push-ups. Core training will help you develop well-defined muscles in your back, chest, and abdomen. The best overall meal plan is one that offers a balanced diet. Eating three healthy snacks a day helps burn calories and fat. Foods high in fiber and water fill you up so that you eat less. Lifting weights builds muscle and speeds up your metabolism. The antioxidants in green tea may accelerate the loss of belly fat. Daily exercise fights inflammation as well as fat. Since visceral fat is internal and not always visible, the only way to know for sure if you've got too much of it is to have a CT scan or MRI. But you can get a rough idea by calculating your waist-to-hip ratio. If your waist measurement divided by your hip measurement is greater than .8, you're over the healthy limit. Ditto if your waist is more than 35 inches in circumference. Does drinking really give you a beer belly? In a 2003 study, adults who drank four or more alcoholic beverages at a time on an infrequent basis were more likely to develop a gut than those who had a single drink daily. And imbibing hard liquor, as opposed to wine and beer, put them at greater risk. The study's authors concluded that regular moderate drinking may protect against belly fat by improving insulin sensitivity. Liposuction removes subcutaneous fat -- the kind just below the skin's surface that clings not just to your tummy but also to your hips, thighs and, sometimes, neck. The procedure, alas, leaves intact the more dangerous visceral fat, which surrounds internal organs and leads to heart disease and other illnesses. So lipo will give you a flatter stomach but won't guarantee better health. The same goes for a tummy tuck. By the time you hit your 40s, a host of physical changes converge to coax the fat that may once have collected on your hips and thighs -- the bane of pear-shaped women -- to land on your tummy instead. If you've always been an apple shape whose fat naturally gravitated to your middle, aging only intensifies the pattern. Here are some of the factors responsible for that extra cushioning. Hormones. During perimenopause (the decade or so before your period stops altogether), estrogen declines and FSH (follicle-stimulating hormone) increases. This fluctuation seems to trigger the accumulation of belly fat. Metabolism. After you turn 40, the rate at which your body converts food into fuel slows by about 5 percent per decade, making it harder to lose weight. Muscle mass. Sometime in your late 30s to early 40s your muscles begin to shrink. And it's a double whammy: Experts say that what you lose in muscle you gain in fat, both in the muscle cells and between the muscle fibers. Fat cells. Once a fat cell, always a fat cell: After you've acquired them, neither diet nor exercise will reduce the number (though they can shrink in size). That fact is discouraging enough, but now new research has found that fat cells increase in both size and number as people age. Stress. When you're frazzled -- and what modern woman isn't? -- your brain increases the production of certain hunger hormones, making you more likely to binge, especially on high-carb, high-fat comfort foods. Sleep. Researchers have found that sleep-deprived people are more likely to overeat than their well-rested counterparts. This is bad news for women, almost a third of whom suffer from chronic sleep deprivation. Medication. A variety of drugs can promote belly fat, either by slowing metabolism, generating fat cells, or increasing appetite. These include certain contraceptives, such as the injectable Depo-Provera; some antidepressants, such as paroxetine; the mood stabilizer lithium; and corticosteroids, used to treat a variety of conditions, including autoimmune disorders. Depression. Dutch researchers found that adults with depression were more likely to gain visceral fat (but not overall body fat) than those who are not depressed. Here again, women are at particular risk since they experience depression at nearly twice the rate of men.